Sonata Arctica’s tour in support of The Ninth Hour (2016) ended last fall and the next album isn’t on the horizon yet, but the Kemi guys decided to pull out something special for the Finnish fans and perform the 5-song stalker series known as the Caleb Saga on The Winter Chapter Tour. Musicalypse caught the melodic metallers, along with the support band Dark Sarah, on the chilly evening of January 21st, 2018, at Pakkahuone in Tampere (photos from The Circus in Helsinki on Jan 24th). Check out the full gallery from Helsinki HERE! I haven’t managed to catch Sonata Arctica live since the final show of the Pariah’s Child tour 2½ years ago – either they haven’t come by close enough or I’ve been somewhere else. Luckily our schedules finally met, because missing out on a full performance of the Caleb Saga would’ve been a real bummer, particularly after not getting to see the band play “The Power of One” on last year’s tour. The night was opened by Dark Sarah, a symphonic metal act fronted by ex-Amberian Dawn singer Heidi Parviainen that had already gathered a sizeable audience at the venue. To be honest, I didn’t really have big expectations for the band, because since I got into other styles of metal and rock after the Nightwish phase I had in my teens, I’ve mostly steered clear of music with classical vocals and big orchestrations. The 45-minute set started off pretty well though, as Parviainen’s vocals stayed at reasonable heights and her enunciation was clear right from the start. “Hunting the Dreamer” caught me off-guard with its partially Finnish lyrics, and Erkka Korhonen (Raskasta Joulua/Northern Kings) delivered a cool guitar solo. 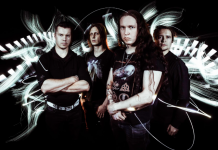 However, it wasn’t until Parviainen introduced ex-Charon vocalist JP Leppäluoto on male vocals that things truly got rolling, both musically and in terms of audience excitement. Leppäluoto had the crowd in the palm of his hand, thanks to his charismatic and commanding presence, and it almost felt like people had arrived early just to see him. His rich baritone meshed nicely with Parviainen’s soprano voice, and they had a good chemistry on stage. Dark Sarah demonstrated a varied mix of sounds, from the traditional shred riffing of “Evil Roots” to the theatrics of “Dance with the Dragon”, and there were even some slightly doomy moments. It was cool that the guitars weren’t merely chugging along in the background (*cough* modern Nightwish *cough*), and the music was played with a heavier touch than most bands in the genre – there was even a quick blastbeat on “Ash Grove”. The only thing that slightly bugged me was that they had no keyboardist on stage, relying heavily on piped-in orchestrations instead, although to be fair, even bands with keyboardists tend to do that. While Dark Sarah isn’t the kind of stuff I’d listen to at home, they put on a great show and are undoubtedly above average in their category of music. After half an hour of waiting, Sonata Arctica finally made their presence known, starting with “Shitload of Money”, which was accompanied by bursts of fog; a new element in the band’s live show for me. “Shitload” isn’t known as a favorite among SA fans (yours truly included), so it was far from a conventional opener, and to make things weirder, it was played as an abridged version where about a minute of the song was cut out. Maybe even the members thought the song was overly long and repetitive? There was also a moment of unintentional comedy when Tony Kakko messed up a few lines in the beginning while the taped backing vocals were naturally spot on, which provided an amusing collision. Unlike “Shitload of Money”, “Paid in Full” and “Black Sheep” are tried-and-true staples that went over well as expected. The latter even included a cool 3-way unison between Elias Viljanen, Henrik Klingenberg, and Pasi Kauppinen on guitar, keyboards, and bass, respectively. I noticed that Kakko was skipping some high notes and singing the most challenging parts an octave lower, but not having any recent Sonata gig experiences to compare the performance with, I attributed this to Father Time finally starting to catch up with him. However, we got an explanation soon afterwards: while introducing “FullMoon”, Kakko stated that his voice was “in shambles” and asked the crowd to sing the intro for him. People obliged, and there was another participatory moment when the band stopped playing before each ‘runaway’ in the chorus, letting the crowd take over. Finally it was time for the Caleb saga, which Kakko said they’d play in a “chronological order”, but apparently this referred to the order the songs were recorded in and not the storyline. Either way, “The End of This Chapter” had been on my personal bucketlist of Sonata songs I’d love to experience live for years, so hearing it at last was a special moment. The live versions on Songs of Silence (2002) and For the Sake of Revenge (2006) have never totally satisfied my appetite, because the beautiful piano outro was left out on both, but this time it was played, and Viljanen even got an extra guitar solo to boot. I surely hope it won’t take the band another 12 years to dust off this gem again! After five songs played back-to-back with no interrupting speeches in between, Kakko started talking about “White Pearl, Black Oceans” and how the band wrote a sequel for it on the latest album. When he asked, “How about we play those two songs too?”, he got a resounding yes from the audience. I’ve seen Sonata play the first “WPBO” a couple of times live already, but as one of the band’s best compositions, the story of the lighthouse keeper never gets old. While the sequel is good enough and provided a nice closure, hearing it right after the original was mildly unflattering – it’s just hard to live up to such an immortal classic. After the audience had been treated to this couple of epics, the band members left the stage, with the exception of Kakko, who sat down and stayed to chat with the crowd, leaving out the traditional encore break. He said it was time to get back to normal order, and Sonata sure did, as “Tallulah” was up next. I think I actually heard someone in the crowd moan “no!” when the familiar piano intro started – though the reaction was amusing, it is a bit of a shame that so many quality ballads often get neglected in favor of “Tallulah”, because it’s the most famous one. However, after a big chunk of complex material, conceding to the mainstream fans was acceptable. This was followed by “The Wolves Die Young” and Kakko’s now-traditional speech thanking the fans for keeping live music alive. Since “Don’t Say a Word” had already been played, “Life” had the honor of closing the show with the Vodka outro tacked on to the end. Ending with a new(ish) tune wasn’t a great idea though, as I saw multiple people walking out when it was announced, and it took the crowd a while to get on board with the “la-la-la” singalong. I appreciate the band’s effort at shaking things up, but maybe “The Cage” would’ve been a more apt choice for the occasion. Although Tony Kakko’s voice had succumbed to the freezing Finnish weather and wasn’t up to par as usual, it didn’t stop him from giving an energized performance, and the rest of the band was in good spirits as well, probably helped by the appreciative audience. 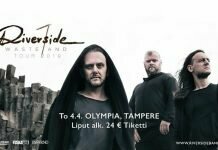 The show was close to sold out, so clearly the guys had been missed in Tampere. The snare drum sound was quite tinny at first (triggering a déjà vu from the last time I saw the guys at Pakkahuone) and Viljanen’s guitar briefly went mute once, but it was good to hear the band members actually singing backing vocals for once instead of being drowned out completely by the backing tracks. Although I didn’t agree with every song pick, Sonata Arctica’s show had a good general structure: warming up with a bunch of singles and hits, offering a big dose of epic material, and rounding things off with a few more crowd-pleasers. The absence of the annoyingly repetitive “I Have a Right” was a breath of fresh air, and it was a pleasure to get a set with such a strong focus on storytelling-oriented, progressive songs, because so many of those are among the band’s best works. Although the Sonata sound has morphed in various ways over time, having some lyrical continuity on the albums is a nice thing, because it makes theme shows like these possible. If the band ever decides to play the “Wildfire” trilogy in full or perform all the wolf songs in one show, count me in!